Widely recognized as the standard text for trainee psychiatrists, the Shorter Oxford Textbook of Psychiatry stands head and shoulders above the competition. The text has been honed over seven editions, displaying a fluency, authority, and insight rarely found in textbooks which makes the process of assimilating information effective and enjoyable.The book provides an introduction to all the clinical topics, sub-specialties, and major psychiatric conditions required by the trainee psychiatrist. Throughout, the authors emphasize the basic clinical skills required for full assessment and understanding of the patient. Discussion of treatment includes not only scientific evidence, but also practical problems in the management of patients in a family and social context. Full attention to ethical and legal issues is given within the evidence-based approach to practice provided in the text. Introductory chapters focus on recognition of signs and symptoms, classification and diagnosis, psychiatric assessment, and aetiology. Further chapters deal with all the major psychiatric syndromes, as well as providing detailed coverage of pharmacological and psychological treatments. The book gives equal prominence to ICD and DSM classifications - often with direct comparisons - making the book relevant to the practice of psychiatry throughout the world.Boasting greater use of summary boxes, tables, and lists within a new modern design, the Shorter Oxford Textbook of Psychiatry remains the most up-to-date secondary level textbook of psychiatry available. The extensive bibliography has been brought up-to-date and there are targeted reading lists for each chapter. 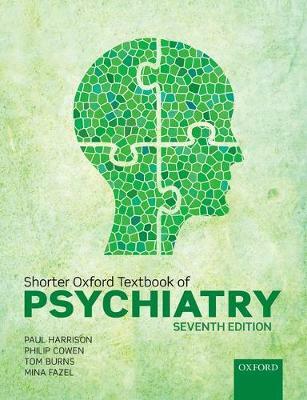 The Shorter Oxford Textbook of Psychiatry fulfils all the study and revision needs of psychiatric trainees, but will also prove useful to medical students, GPs, qualified psychiatrists, and those in related fields who need to be kept informed with current psychiatric practice.